This section is for YOU...THE FANS! I'll be putting your poems, art work, letters, pics- just anything of Stevie by you. Just e-mail them to me and I'll be sure to put it up. You never know Stevie may see it! The ABCs of The Brock Bunch! A is for Alexa and Paige, awesome and amazing! B is for Bart and Buster, the bouncing and breath-taking Brock animals! C is for Cousins, crazy and cool combinations! D is for Dayton, da home of da dynamic Brocks! E is for Enhanced CD, excitedly arriving June 10! F is for Fans, freaky but funny! G is for Gifts, given by the gorgeous fans! H is for Humor, a hilarious and happy trait all the Brocks hold! I is for I, as in me, an inseparable fan! J is for Jim, joyous and jumpy! K is for Kristin, kool and kind! L is for Lydia, lovable and luminous! M is for Magic Beam Management, majestically moving mountain-high! N is for Nick and Nate, nifty and neat! O is for October, the one-month Stevie was born. P is for Press, hearing lots and lots from the powerful fanatics! Q is for Qtie-pie, never quiet and quite silly! R is for RAWR, the roaring sounds of Zoe! S is for Stevie, superbly singing and sugary sweet! T is for Timberlake, terrifically and totally tubular! U is for Uh-Oh, um you unexpectedly fainted! V is for Vicki, vivid and very vibrant! W is for WIRE Records, WHOA way wow! X is for Xtra; were taking it to the X-Treme! Y is for Yahoo, you and the youth know its the street teams residence! Z is for Zoe, zig-zatic zebra dog! NOW I SANG MY ABCS! NEXT TIME WONT YOU SING WITH ME! When I see your face I can't do anything but smile. When I was down and depressed you cheered me up just being you! You are the angel us fans have been waiting for! 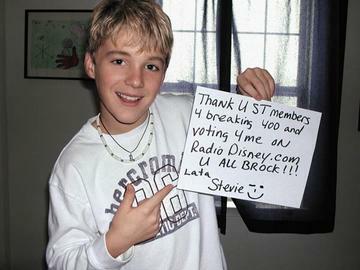 I am proud to be a Stevie Brock fan & I will always be one! You totally Brock Boy Keep up the good work!